A great way to cool off this summer and still serve soup is with gazpacho. 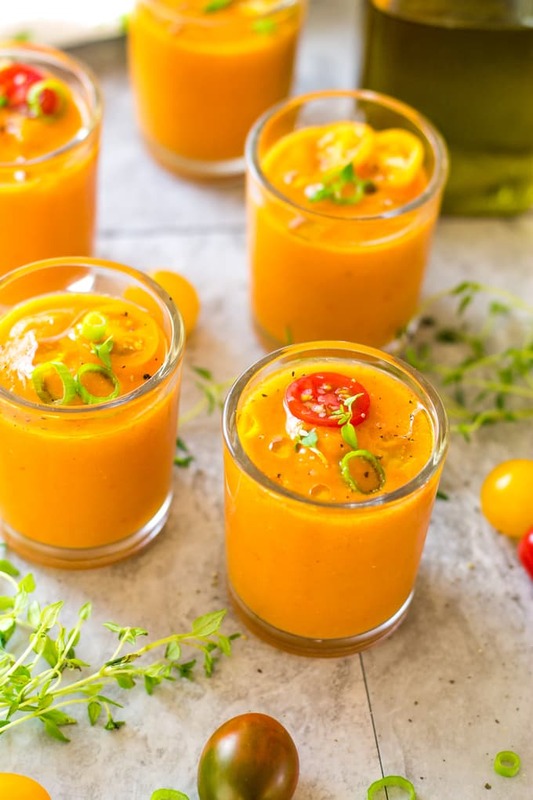 My roasted tomato gazpacho shooters are rich, bright, and with a hint of spice! My son walked in while I was taking the pictures of these Roasted Tomato Gazpacho Shooters he asked me what I taking pictures of. I told him “Gazpacho” and he said, “I thought Despacito was a song and not a soup.” I almost dropped my camera because I was laughing so hard. If you have never heard of gazpacho, it might be a little bit puzzling. It is soup, but it is served cold. I am a firm believer that hot food should be served hot and cold food should be served cold. My hubby likes to eat his hot food at room temperature or even cold. I can’t even eat cold pizza! My brain is weird like that. I never thought I would like a cold soup so when I was researching recipes for gazpachos I thought I would add my hot twist to it. With all the colorful tomatoes available at the market right now I tend to buy a few pounds at a time. I love roasting the tomatoes in a little olive oil and fresh herbs to use on crostini, with my eggs in the morning, or as a quick side dish. But I always serve them warm. Deciding to go out on a limb, I roasted the tomatoes as I normally do. I took the ones that I didn’t eat right then and placed them in the fridge overnight. The next morning I took them out and tasted them cold. Pretty tasty if I do say so myself! I think I can do these cold for sure! So into the blender, the roasted tomatoes went, along with the peeled cucumber, bell pepper, garlic, and the onion. Blending until all combined made a great vegetable juice. Watch out V-8! Normally, some stale bread would be added to thicken the soup a bit and add some texture but I left it out so the roasted tomato gazpacho is gluten-free. I do add olive oil to add a silkiness to the texture. Another addition to the roasted tomato gazpacho is a tangy component. It is typical to add a vinegar of some sort, so I add sherry vinegar (popular in Spain) and red wine vinegar. Feel free to use balsamic vinegar if you have that. A hint of cayenne pepper, salt, and pepper for seasoning. If you want a smoother roasted tomato gazpacho, run it through a sieve to remove the chunks. For tapas purposes, I am serving this bright roasted tomato gazpacho in shooter glasses that are really votive candle holders I got at the dollar store. They hold a little more than your standard shot glass. 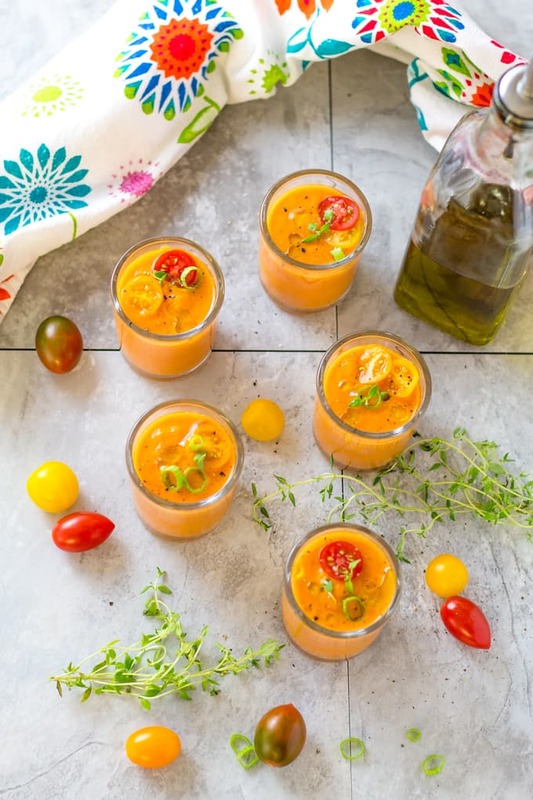 Drizzled with a light touch of olive oil, fresh green onion, tomato slices, and thyme, these gazpacho shooters will be a hit at your dinner party! Serve it with my Smoked Paprika Almonds, my Pan Con Tomate using fresh tomatoes too, and wash it down with a Kalimotxo Wine Cocktail. If you never thought you could eat cold soup, think again! 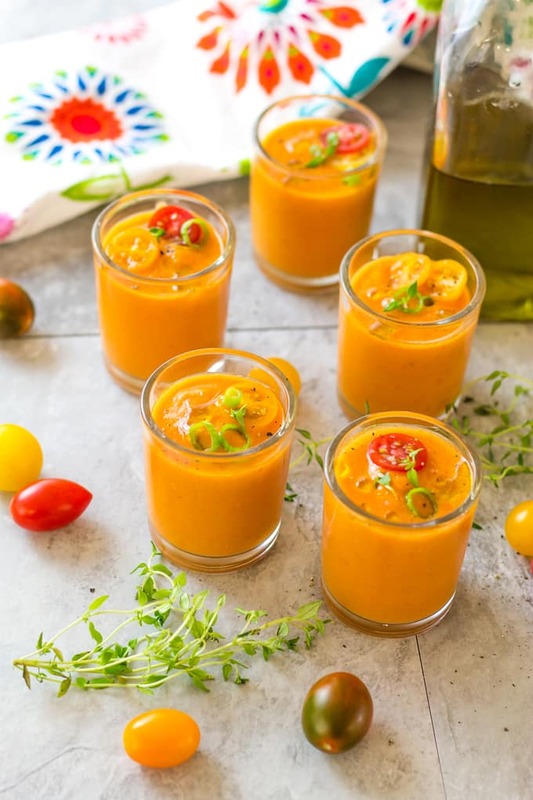 My roasted tomato gazpacho shooters will delight your taste buds, wow your guests, and make a delicious use of all the fresh vegetables this summer. 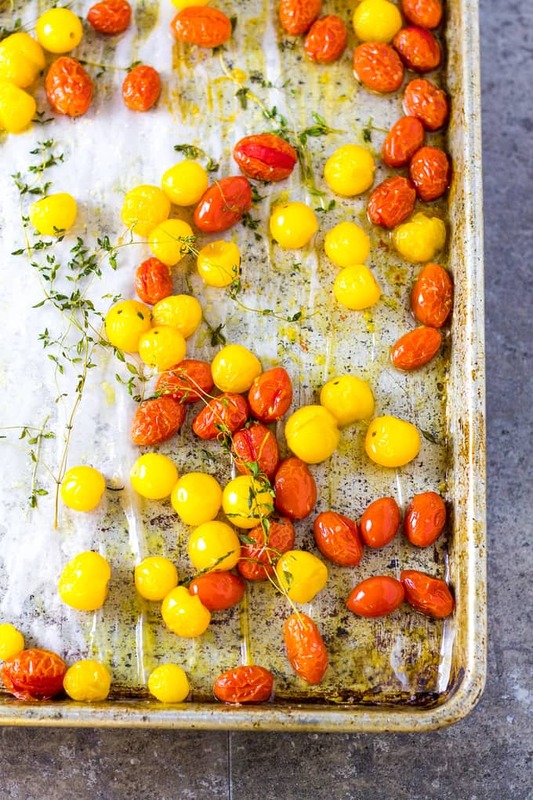 Add your tomatoes, fresh thyme, and 2 tablespoons olive oil to a baking pan. Cook in the oven for 15 minutes or until tomatoes just start to burst. Remove the pan from the oven and let tomatoes cool. Store in the fridge until cool or overnight. When ready to make the gazpacho, remove all the ingredients from the fridge. In a blender, combine roasted tomatoes, cucumber, onion, and bell pepper. Pulse to blend the vegetables. Add the olive oil, vinegar, and garlic. If you want the gazpacho smooth, strain through a sieve and into a storage container. Add salt, pepper, cayenne to taste. Serve cold in shot glasses garnished with green onion slices, tomato slices, and a drizzle of olive oil. This soup tastes best if you let it sit a while so the flavors can mingle a bit. 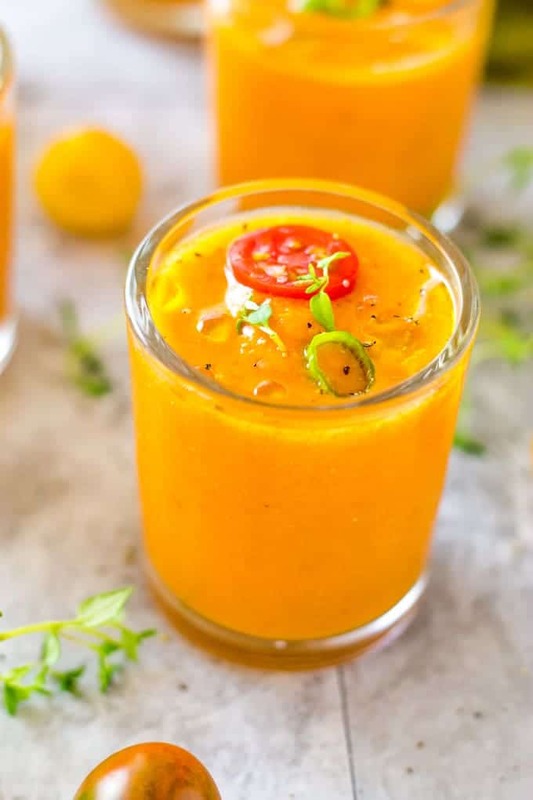 This recipe is inspired by Wholesomelicious gazpacho. 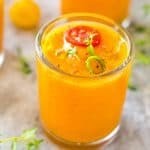 I just pinned your awesome Gazpacho Shooters, these look delicious. 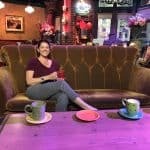 Thanks so much for sharing your post with us at Full Plate Thursday and have a great weekend! These are so perfect for this week’s Fiesta Friday party! Thanks for taking them along with you. Happy weekend! What a great summer party appetizer! Thanks for sharing at the What’s for Dinner link up! These look delicious! I love that you served them in votive holders. That’s so smart. Thanks for the amazing recipe!